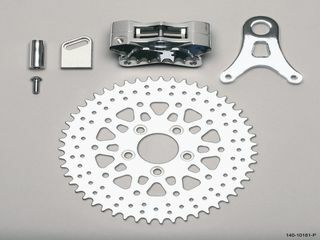 Wilwood�s Sprocket Brake system is available in either 48 or 51 tooth sprockets. The bolt circle is consistent on all Harley Davidson models, 5� x 3.25�. The accompanying GP 310 calipers are available in either chrome or a bright polished finish. Sprocket brake calipers are currently available for left hand applications only.